Brenda starts off the course by teaching us her way of covering a cake board using the ‘upside down method’. Trimming the edges using a pizza cutter or sharp knife gives a great finish that leaves no jagged edges. The board is finished off by adding wooden floor details using a ruler and dresden tool. 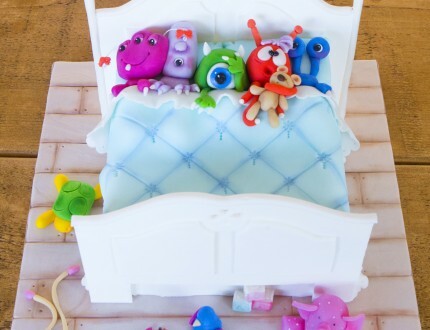 The headboard and footboard of the bed are made using gum paste/flower paste (alternatively you can use sugarpaste mixed with some tylose powder) and you can print off the Monsters in Bed PDF templates to guide you. The headboard and footboard should be made a day or so before the cake which will allow them plenty of time to harden. Tip: Laminate the printed templates after cutting them out for a template that can be used over and over again. Before leaving to them to dry, add some details to the headboard and footboard. Brenda uses a pattern creating tool which can be found here, however you can use a small heart or floral cutter for this section. Tip: Use a cutting mat with measurements to make everything symmetrical. Adding the ruffled sheets to the base of the bed is simple – start with rolling out some sugarpaste (make it really thin!) then cut out circles using a scalloped pastry cutter. Now cut out the centre of your frilly circles using a smaller circular cutter to make a doughnut shape. You can then use a bulbous tool (or ball tool) to create the frilled edges and finish this by attaching layered frills to the base of the bed. Brenda finishes this section by attaching the headboard to the bed – don’t do the footboard yet as it can get in the way! Once you’ve attached the ruffles created in Lesson 4 (attach them around 1.5” high in layers as shown) you can now create the fake bodies for the bed. 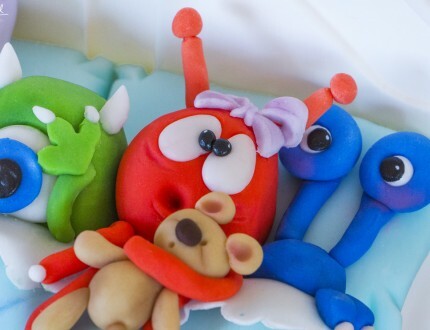 Using sugarpaste balls at around 1” (2.5cm) in diameter, you can create the body shapes to your liking. Place the bodies 2.5” to 3” towards the centre of the bed which will leave room for pillows and the monster heads. Tip: You can make unusual shapes for the bodies – think outside of the box! The bedspread can now be created – first measure the area where the bedspread will go – Brenda ended up with an 11” (28cm) piece of sugarpaste – and cut the sugarpaste to size. A crosshatch design is added using a ruler and dresden tool. You can use an emboss tool (or even a texture mat) to match the floral design used here or tweak it to your liking using texture mats or edible printed sheets. 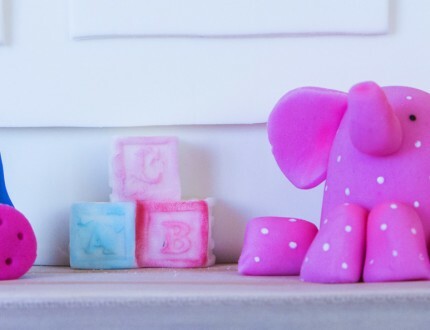 Roll out some sugarpaste in the colour of your choice, approximately 3” (7.5cm) wide and 1.5” tall (3.8cm), to create your pillows. Roll this out to approx 0.5” (1.3cm) thick, or as thick as required. Smooth off the edges using your fingers, then pinch the corners. Extra details can be added to the corners by using a dresden tool to make indentations. Tip: If you don’t have enough height with the two pillows, make four! Brenda covers some great techniques and designs to create her monsters, which will certainly help you to create your own. 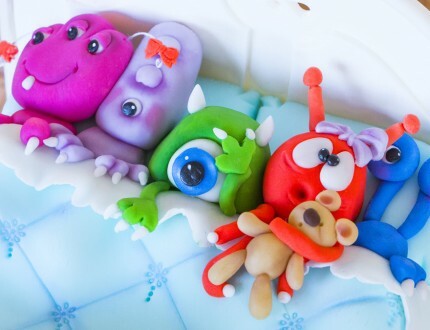 Try and make these as fun as possible and find out the lucky little recipient’s favourite colours and monsters to recreate these for a customised cake! Tip: Always start from the middle monster and work your way outwards. The monsters faces are continued in this lesson and finished with the very end blue monster. 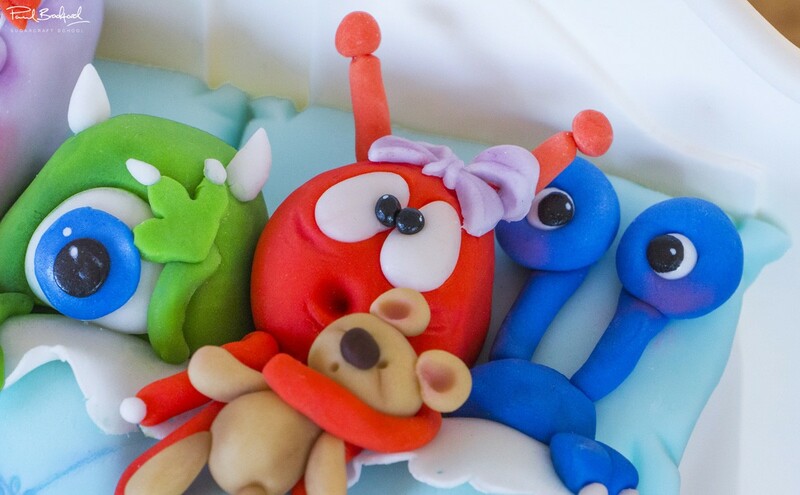 Arms and extra bits are created for the monsters using sugarpaste in each monster’s colour. Remember to do what you’re comfortable with and make the design your own. Fingernails are then created using a tiny ball tool (or back of your paint brush) and then tiny sugarpaste teardrop shapes or balls are glued onto the fingers to create the fingernails! Tip: Change the colour of the fingernails for something more funky! Brenda starts the facial details by rolling out black sugarpaste (as thin as you can!) followed by cutting this out using a number 5 or 6 circular piping tip. This creates some great pupils for the eyes! Using 22 gauge florists wire, antennae can be created then wrapped with sugarpaste or an impression mould can be used to create shapes for the antennae. Tip: Have fun with the expressions! Next, an 8” skewer (cut down to size required) is used for the bed post. Use a strip of sugar paste of the same length and glue around the skewer and make sure you have the sharp end of the skewer facing towards the cake board. 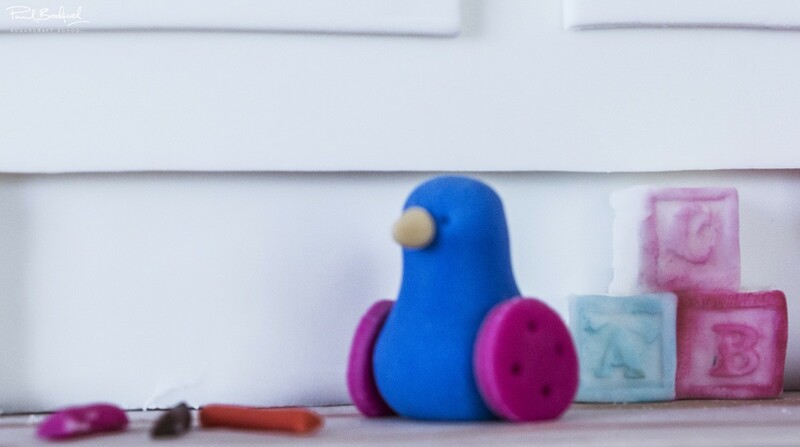 Top this off with a small ball of sugarpaste and then your bed post is complete! Simple and cute is the key to the toys scattered around the bed. Brenda shows us how to make various toys starting with a teddy bear. Tip: Kids birthday? Try and make their favourite toys for this! Brenda continues to create the toys, including an elephant stuffed toy. This is made with the help of the assorted shapes Ateco cutter set and some bright coloured sugarpaste. 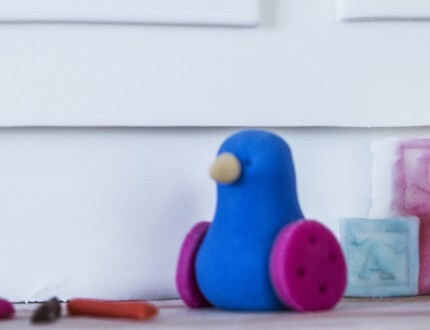 Brenda teaches us some incredibly useful techniques to make other small and simple toys here like the adorable turtle, skipping rope and a blue wheelie duck! 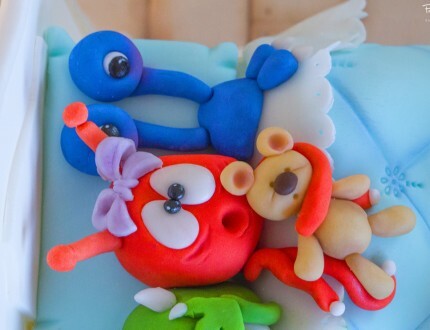 The shading covered in this lesson will transform your cake and make the colours pop! A Petal Crafts Petaldust palette is used for the shading which features plenty of shades of light to dark colours which look extremely eye-catching. Once you’re happy with your shading you can finally attach the footboard of the bed, and your cake is almost done! Tip: Remember to create shading using a darker colour of the same tone, it gives extra depth. Thinly rolled sausage shaped strips of sugarpaste are added to the headboard and footboard of the bed to finish them off. Glazing the eyes (Brenda uses a confectioners glaze) adds a great shine and realism and using a small ball tool you can add a tiny white dot to each eye ball (as shown) which makes a huge difference for such a small decoration. And with that final detail, the cake is now complete…well done! Tip: Use glaze to give the eyes sparkle! Brenda shares some other ideas which you can incorporate in to this fantastic cake design. 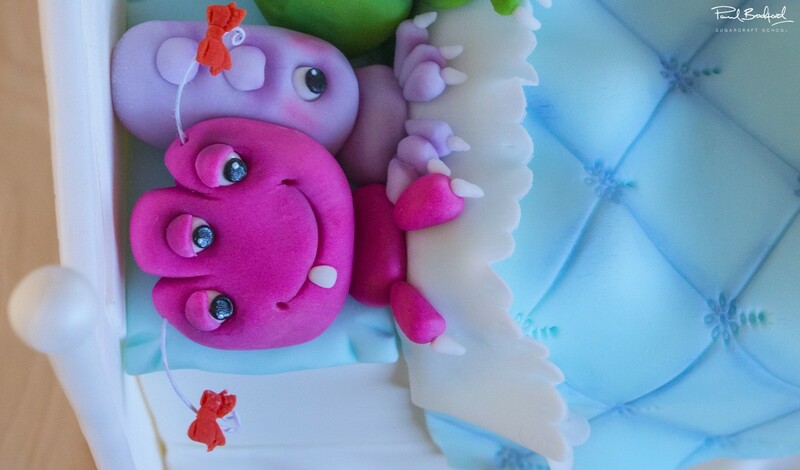 We would love to see your take on the Monsters in Bed Cake – please share your snaps with us on our Facebook Page and Brenda’s where you will also find a fantastic cake community! 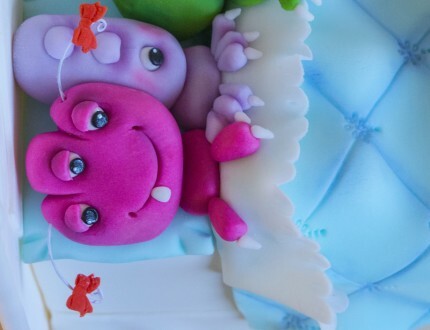 Brenda Walton of Sugar High teaches us how to create her fantastic Monsters in Bed Cake. 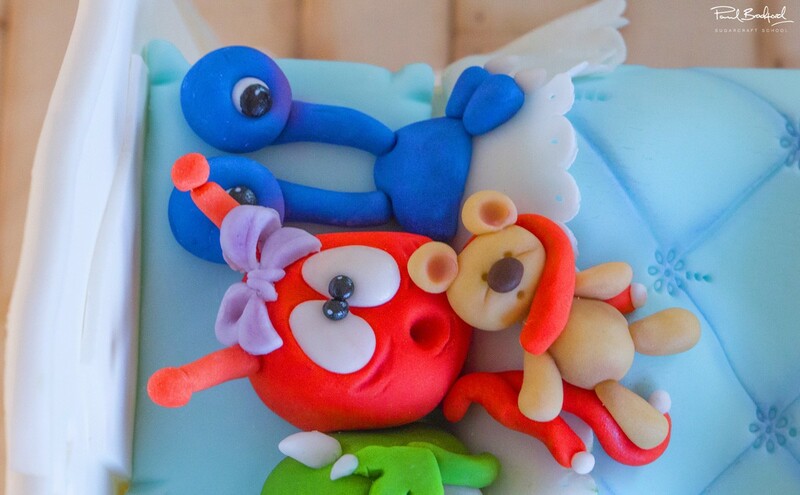 A perfect cake for a birthday party, it can be customised with ease to create the perfect treat for a boy or girl's celebration by adjusting the colours and the details on the quirky little monsters. Perfect for intermediate level decorators, this cake takes one full day to complete. 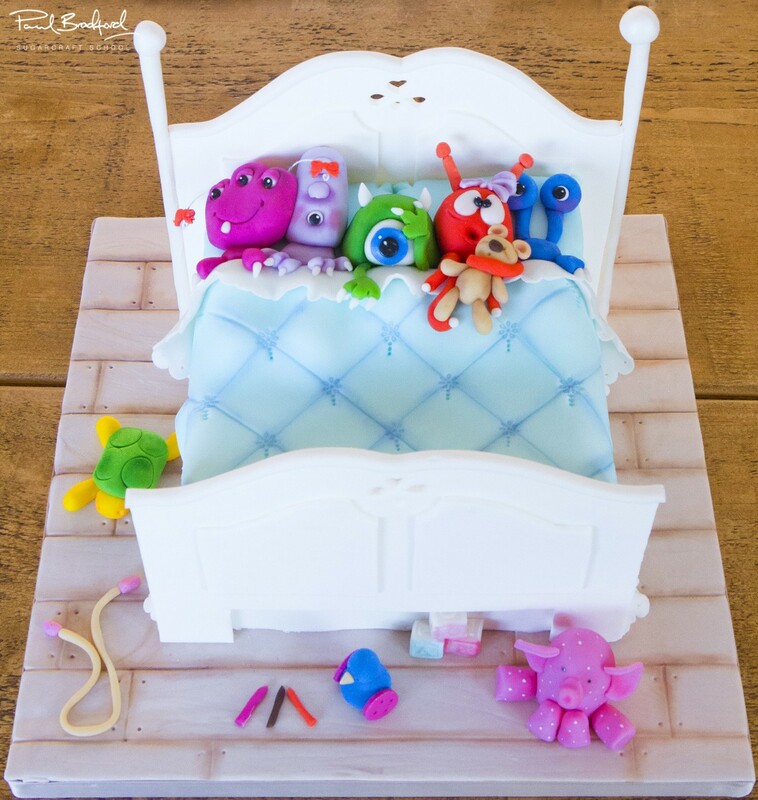 We would love to see your take on the Monsters in Bed Cake - please share your snaps with us on our Facebook Page and Brenda’s where you will also find a fantastic cake community! 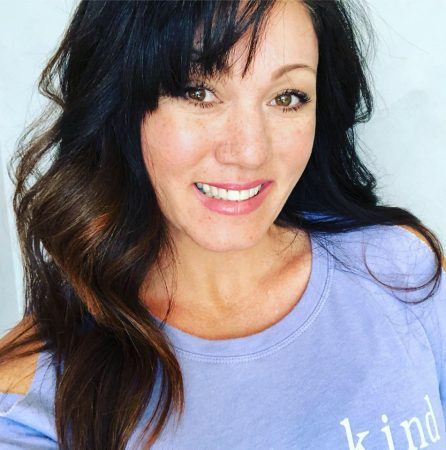 Brenda also flew in all the way from the good old US of A. She has created an awesome course for us which has been super popular. Brenda also has an amazing facebook page, full of tips, tricks and all things cake, you may have already heard of it - Sugar High Inc? She also supplies the famous BakeDrops for Cake photography! If you haven't heard of them - they are must! Go check them out! © 2019 CakeFlix Ltd. All rights reserved.